Folger Pinnacle was not visited during our recent 3-week July cruise because it is the only site on the NEPTUNE Observatory that is serviced by professional divers; the other four nodes and the Folger Deep instrument platform (complement site at Folger Passage node; read Folger Deep blog entry) are too deep for divers and the waters at Folger Pinnacle are generally too turbulent for large remotely operated vehicles. 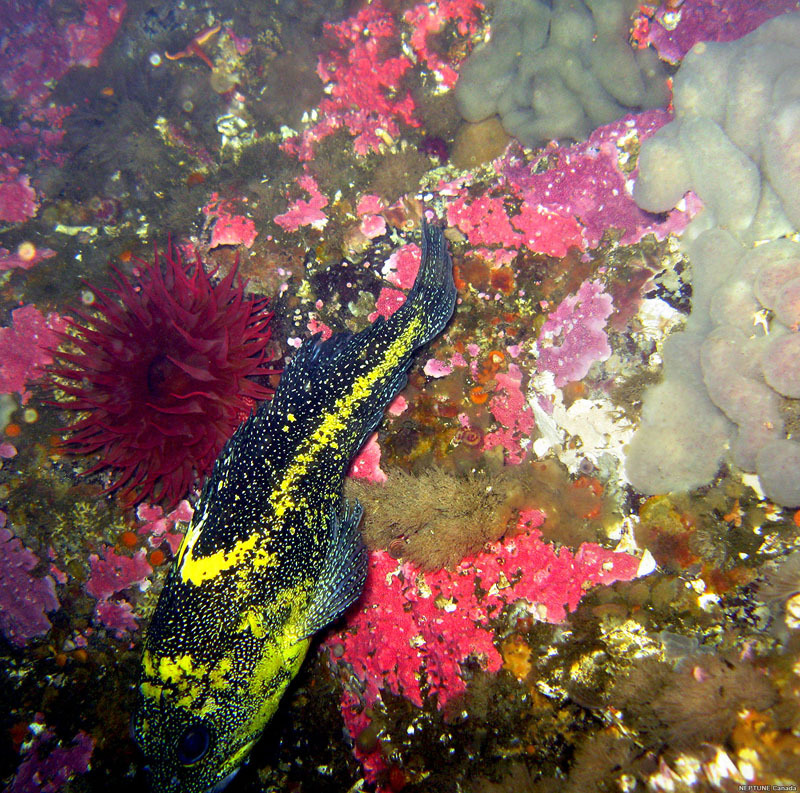 In addition, Folger Pinnacle is a unique site, situated in a rockfish conservation zone, where sunlight penetrates to a shallow reef populated by an abundance of life. We were warned by Captain John Richards of BMSC that our marker buoy was missing (again) so the first task when we arrived at location on August 2, 2011 was to install a new purpose-designed marker buoy. 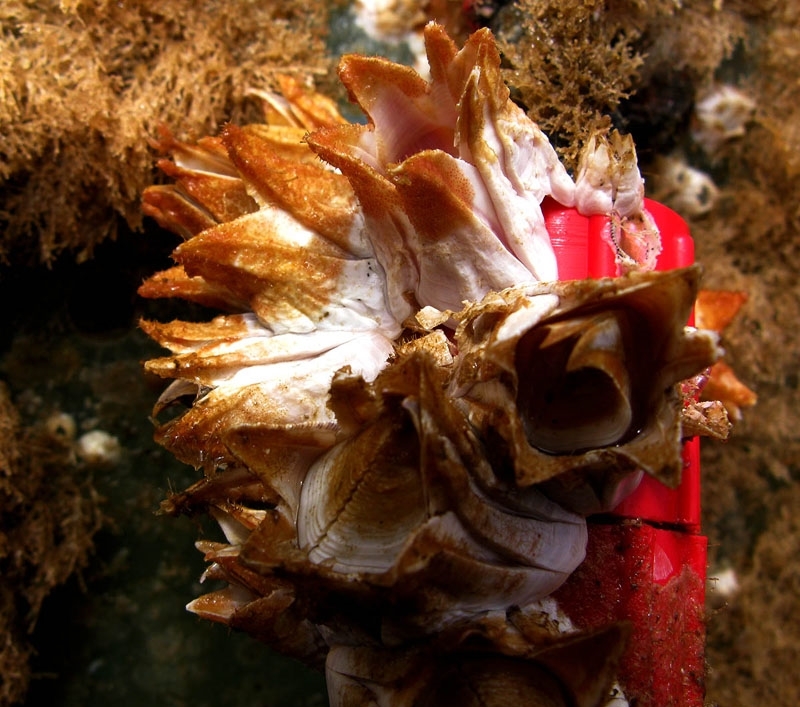 On the seafloor, all the instruments desperately needed intensive cleaning due to extensive biofouling--in other words, barnacles, algae and other forms of life were taking over! This interferes with data collection as sensors and lenses become blocked. We were pleased to have the expertise of Glenn Hafey and the Pelagic Technologies commercial dive crew again with us this summer. This is the dive team that previously helped us install and connect Folger Pinnacle (read Pelagic's news on the installation). In addition, thanks to the BMSC scientific dive team led by Siobhan Gray who captured video footage of the operations and aided in cleaning the instruments. When they first swam down to the platform, they thought it had disappeared. Every available surface had been colonized by reef creatures and some instruments were transformed beyond recognition. Following specific instructions from manufacturers, divers restored some of the instruments with a multi-purpose scrub and wipe sponge, plastic spatulas, a small soft bristle brush, and cotton cleaning cloths. Zinc-oxide was smeared onto transducer surfaces to deter future biofouling, but we’re not taking any bets this won’t happen! Thanks to our intrepid dive crew, the instrument platform went through an incredible transformation and it became possible to distinguish the various instruments once again. Two instruments did not remain with the platform. The divers retrieved the Sidus HD video camera and the 3D camera array. They also removed the bio shutter from our WET Labs fluorometer/transmissometer in a very delicate process (it apparently became stuck open when a barnacle took up residence between the copper plate and the optical surface). The instrument recovery process with divers is much different than with ROPOS. In order to recover the 3D Camera Array and the Sidus Camera Assembly, divers had to unbolt them from the Folger Pinnacle instrument platform. Next, the divers attached lift bags to the cameras’ instrument frames and inflated them. The 3D Camera Frame weighs approximately 180 lb in water and 250 lbs in air, while the Sidus Assembly weighs approximately 19 lb in water and 30 lb in air. The bags were to make the instruments neutrally buoyant and easier to control. After that they attached a line to the camera frame, which was pulled up by the surface team led by Captain John Richards of BMSC using a capstan (a revolving vertical-axled type of pulley). After cleaning we were able to regain access to good scalar data from all instruments, including the single-point acoustic current meter, which had failed in June 2011. The following data plots reflect the improvements seen after instrument cleaning. A clear improvement resulted for this instrument, as shown in the following two plots of beam 2 signal strength before (top figure) and after (bottom figure) the cleaning program. Average echo intensity increased from 77 counts (before cleaning) to 113 counts (after cleaning). According to the data, beam 3 failed first. Notice that the diagnostic counts after cleaning program are well below the actual beam counts, which suggests good data. All three beams showed an increased sensitivity. Also note that the diagnostics counts (blue dots) are now well below the respective beam counts, providing sufficient gap to produces reliable current projections. The cleaning program improved the signal strength of all three beams on the Nortek Aquadopp profiler. The Nortek downward-looking current profiler was performing satisfactorily even before cleaning; however, initial inspections showed significant biofouling. The dive team did some rigorous and delicate cleaning to remove bio-fouling from the transducers. This device indicates the amount of ambient light detected at the platform (23m below the surface). Sensor sensitivity increased from almost nothing to very clear daily spikes beginning August 6, 2011. After the bio-shutter was removed and the instrument cleaned, the variability of chlorophyll captured jumped from zero to approximately 25 ug/l. The 3D high-resolution camera imaging system is getting its lighting system repaired for redeployment in 2012. A research team led by Sally Leys and Herb Yang of the University of Alberta will use the custom-built 8-lens camera system to make 3D images of sessile (non-mobile) suspension feeders living beneath the platform (more). The Sidus video camera was intended to provide a live video spyglass for researchers studying the rich ecosystem inhabiting Folger Pinnacle Reef. Unfortunately, the camera did not function properly, and will be replaced. All in all, the 3-day cruise was a great success! We are now implementing a regular cleaning and inspection program. We wish to thank both BMSC and Pelagic for their tremendous assistance with this important work!